There has been a lot of news coming out of the deployment of 2nd Brigade Combat Team (B.C.T. ), 34th Infantry "Red Bull" Division (2-34th BCT) recently. Some of it has been exciting, as soldiers continue to aggressively pursue their respective missions. Some of it has been inspiring, as citizens build bridges from Iowa to Afghanistan. And some of it has been heart-breaking, as buddies, friends, and family mourn the deaths of soldiers killed in action. In an April 25 update, the Des Moines (Iowa) Register reports that, following a April 23 combat incident in Afghanistan's Kapisa Province, Iowa National Guard Spc. Zachary Durham, 20, of Des Moines has been transported to a hospital in Germany, and may return stateside by the end of the week. He has talked with family, is reportedly in good spirits. Durham was shot in the same Kapisa Province attack that resulted in the death of another "Red Bull" soldier, Staff Sgt. James A. Justice, 32, of Grimes. Both soldiers are members of 1st Squadron, 113th Cavalry Regiment--part of the Iowa's 2nd Brigade Combat Team (B.C.T. ), 34th Infantry "Red Bull" Division (2-34th BCT). Funeral arrangements for Justice are pending. The April 23 funeral of Spc. Donald L. Nichols, 20, was held in the Waverly-Shell Rock High School. Iowans lined much of the 15-mile distance from the funeral to the graveside service, holding flags, saluting, and otherwise standing witness. The 2009 song "Hero," by the Christian rock band Skillet, was played during an interlude at the funeral. The official video of the song is posted here; a tribute video to Nichols featuring the song is posted here. While the frenetic combination of music and pictures is a little dissonant--not at all in keeping with the somber, overcast mood of the day--it does a great job capturing depicting how many people were out to welcome Nichols home one last time. Some 55 "Red Bull" soldiers from the Minnesota National Guard's 2nd Combined Arms Battalion, 136th Infantry Regiment (2-136th CAB), headquartered in Rosemount, Minn., are preparing to deploy to Afghanistan on an Embedded Training Team (E.T.T.) mission. See news article here. Such a training mission may be similar to what Nebraska's 1st Squadron, 134th Infantry are doing during the deployment to Afghanistan with Iowa's 2-34th BCT. Working through Afghan National Army personnel, soldiers of Iowa's 1st Battalion, 168th Infantry Regiment (1-168th Inf.) recently distributed 6,000 coats and other clothing items to Afghan civilians in remote villages in Paktiya Province. The clothing was donated, collected, and transported through the efforts of Rapport Afghanistan, a Minnesota-based non-profit started in 2010 by 1-168th Inf. alumnus Shawn Mingus, Chanhassen, Minn. Weather and transportation problems postponed delivery from January to April. “Rapport Afghanistan is a great example of outstanding, grass-root support from volunteers in America who donated time and money for a coat drive to donate warm clothes for the Afghan people who need them,” said 1-68th commander Lt. Col. Stephen Boesen. See Army news article here. On the other side of the mission spectrum, two companies of 1-168th Inf. soldiers this month also helped 400 Afghan personnel conduct Operation Rainbow Valley, a traffic-control effort to snare insurgents operating in the Zormat District of Paktiya Province. The mission paid off when a highly sought-after insurgency financier was captured on his way home from market. “We’ve definitely taken the wind out of the sails of the insurgents for a while,” said Delta Company commander Capt. Kent Greiner of Nevada, Iowa. “We’re striking a nerve with them and we’re going to keep striking that nerve to see what happens.” See Army news article here. According to a blog-post earlier this week, the Omaha World-Herald's reporter-photographer team of Joseph Morton and Alyssa Schukar is returning stateside after spending nearly two months covering Midwesterners deployed to Afghanistan. Morton's interviews and insights have told the citizen-soldier story well, and Schukar's portraits of Midwestern men and women in uniform are like fine art. You can continue to follow their coverage here. An April 24 Des Moines Register Sunday news feature about Red Bull women in combat has since appeared in USAToday, the Army Times, and other venues. You can continue to read the Register's regular coverage of the 2-34th BCT deployment here. Announced April 25, the Red Bull Rising blog has been nominated for a Milbloggie Award under the U.S. Veteran category. The People's Choice-style competition "recognizes military bloggers for their contribution to blogging, news and information, and to the military over the past year." Voting will close on Thurs., April 28, at 7pm EST/4pm PST, and no registration or log-in is required. U.S. Army: "Life, Love & Truth" written by Illinois National Guard recruiter, "Afghan Journal" author, and Red Bull Rising guest-blogger Jeff Courter. Go Guard! U.S Marine: "Glory, Guts & Glitter," written by single-mother and Marine Christina Fawn. She writes with a bayonet, and will occasionally cut your heart out and make you like it. Plus, she's from Minnesota, and can find Camp Ripley on a map. So she's practically a Red Bull, too! U.S. Reporter: Tom Sileo writes "The Unknown Soldier," which routinely and sensitively celebrates the lives of U.S. military personnel. U.S. Military Supporter: The writer of "Little Drops ..." who uses the callsign "Kentucky Woman," has been a long-time supporter of Red Bull Rising, and has worked hard to introduce Charlie Sherpa around the Milblogger community. It's people like her that make the Internet worthwhile. Click here for a Milbloggie ballot. Red Bull Rising, a blog focusing on the largest deployment of Iowa National Guard soldiers since World War II, is a finalist in the Fifth Annual Milbloggies, a "People's Choice Awards"-style competition administered by Milblogging.com, a Military.com website. According to the Milbloggies website, the award "recognizes military bloggers for their contribution to blogging, news and information, and to the military over the past year." Readers can vote for the blog to receive an award by using a simple web-ballot found here. Red Bull Rising appears under the "U.S. Military Veteran" category. Voting will close on Thurs., April 28, at 7pm EST/4pm PST. The Red Bull Rising blog can be found at: www.redbullrising.com. 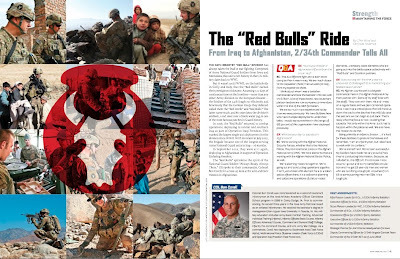 When it was started in December 2009, the Red Bull Rising blog was written from the perspective of "Charlie Sherpa," a soldier preparing to deploy to Eastern Afghanistan with the Iowa Army National Guard's 2nd Brigade Combat Team (B.C.T. ), 34th Infantry "Red Bull" Division (2-34th BCT). When the unit mobilized without him in July 2010, Sherpa covered the unit's training at Camp Shelby, Miss., and the National Training Center, Fort Irwin, Calif. while still in uniform. A freelance writer and editor in his civilian career, Sherpa continued to write the blog after his December 2010 retirement following 20 years in the Iowa Army National Guard. "I'm kind of a mash-up of a military-unit historian and citizen-journalist," Sherpa says. "I now write the blog more in third-person than from first-person perspective, but enjoy the ability to switch back and forth. I've also maintained the 'not-so-secret identity' because it's proved surprisingly useful in negotiating the spaces among officers, enlisted soldiers, spouses, and others." 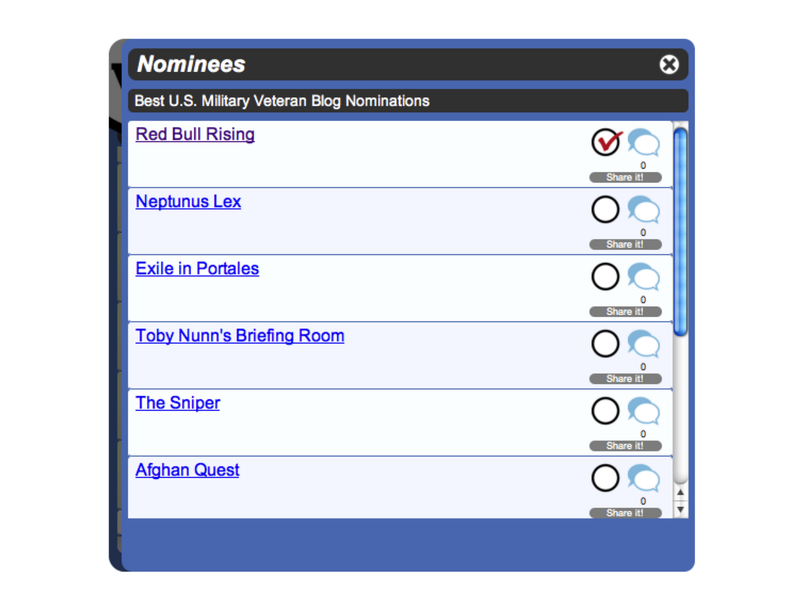 Originally nominated in both the U.S. Army and U.S. Reporter award categories, Milbloggies contest officials apparently consolidated the nominations by listing Red Bull Rising under the U.S. Military Veteran category. "By telling our Red Bull stories, I hope to illuminate what makes the U.S. National Guard so unique in history, geography, and mission," says Sherpa. "I'm still applying to embed with the Red Bulls in Afghanistan as civilian media later this spring," says Sherpa. "And, as soldiers and families know too well, a deployment doesn't end with a homecoming parade. There are months of recovering and resetting as units, as families, as friends, and as citizen-soldiers." 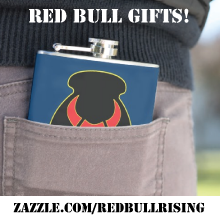 "Besides, the Red Bull continues to rise. The 34th Division's 1st Brigade Combat Team--the Minnesota Red Bulls--is headed to Kuwait and Iraq later this year." To learn more about the Red Bull Rising blog, and its pseudonymous author "Charlie Sherpa," click here. A list of all 2011 Milbloggies finalists can be found here. Winners will be announced at the Sixth Annual Milblog Conference to be held April 29-30 in Arlington, Va.
Staff Sgt. James A. Justice, 32, of Grimes, Iowa, was killed approximately 10 a.m. 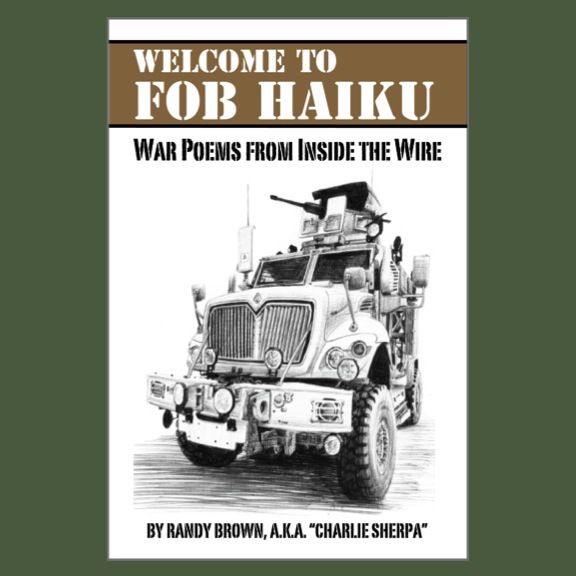 Sat., April 23 when the helicopter-borne Quick Reaction Force (Q.R.F.) of which he was a member came under small-arms fire in Afghanistan's Kapisa Province. The small force had been attempting to secure the crash site of a 2-person OH-58 "Kiowa" scout helicopter assigned to another U.S. Army unit. Also injured in the attack was Spc. Zachary H. Durham, 21, of Des Moines. Both are members to Alpha Troop, 1st Squadron, 113th Cavalry Regiment (1-113th Cav. ), an Iowa National Guard unit headquartered in Camp Dodge, Johnston, Iowa. The 1-113th Cav. is part of the 3,000-soldier deployment to Afghanistan of the Iowa National Guard's 2nd Brigade Combat Team (B.C.T. ), 34th Infantry "Red Bull" Division (2-34th BCT). As "Task Force Red Bulls," most of the 2-34th BCT is responsible for helping the Afghan government, military, and police secure the provinces of Parwan, Panjshir, and Laghman, as well as portions of others. Some units deployed with 2-34th BCT deployed have been assigned under other task forces and other provinces, but Kapisa is not one of them. Coalition forces operating in Eastern Afghanistan, to include Task Force Red Bulls, are assigned under the active-duty Army's 101st Airborne Division, which operates as "Combined Joint Task Force-101" (C.J.T.F.-101). According to the CJTF-101 website, Kapisa Province is the responsibility of Task Force La Fayette, comprising French coalition forces. According to Iowa National Guard officials at a Sunday night press conference at Camp Dodge, the Alpha Troop soldiers had earlier conducted a patrol in the Parwan security zone surrounding Bagram Air Field ("BAF"), when CJTF-101 requested soldiers to immediately secure a Kiowa scout helicopter that had made a "hard landing" in Kapisa Province. The cause of that landing is still under investigation. The Iowa soldiers were assigned the QRF mission because they were "readily available" at Bagram Air Field, said Iowa National Guard spokesman Col. Greg Hapgood. While guard officials were unable to characterize either the type of weapons or the intensity of the attack that killed Justice and injured Durham, they did say that Justice died at the scene. 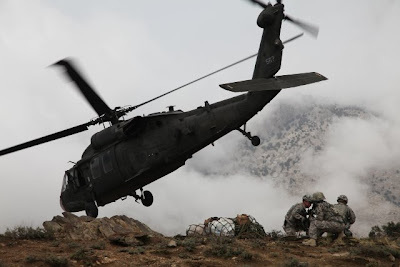 After the QRF traveled from Bagram to the crash site via UH-60 "Blackhawk" helicopters, landed, and came under attack, "pathfinders" trained in establishing landing zones were dispatched from 101st Airborne Division and inserted into an area south of the crash site. Air Force pararescuemen were also dispatched and inserted near or onto the site. According to Iowa guard officials, a U.S. Air Force A-10 "Warthog" and additional armed U.S. Army Kiowa helicopters arrived to eliminate the immediate enemy threat. Justice was reportedly killed and Durham wounded while moving off their landing zone, which at the time was considered "hot" and still under fire. Durham has since been evacuated to Craig Joint Theater Hospital, Bagram Air Field. His injuries were not specified by officials. Justice is a 13-year veteran of the Iowa National Guard, and deployed to Afghanistan with the 2-34th BCT only last February. "One of his goals was to get on this deployment," said Sgt. 1st Class Kevin Schaefer at Sunday evening's press conference. "He wanted to get into the fight." Prior to mobilization, he was employed full-time by the Iowa National Guard, and Schaefer had been his supervisor. Schaefer described Justice as level-headed, hard-working, and easy to talk with. "He had an ability to lead soldiers and have them follow." Justice had previously deployed to Kuwait (2001), Egypt's Sinai Peninsula (2003-2004), and Iraq (2005-2006). Justice is survived by his wife, Amanda Jo, and a 3-year-old daughter Caydence Lillian, of Grimes; his father and mother, Larry and Lillian Justice, brother Kenny Justice, sisters Denise Christensen and Christy (Kevin) Lingle of Manilla. James Alan Justice meant many things to every person he encountered. He was the funny best friend named "Juice" that could be counted on when needing to be cheered up; the uncle who always knew just what to say and when to hand out hugs; the son who was his parents' pride and joy; the father who loved his little girl more than anything in the world and couldn't wait to have more children; and the husband who loved to put a smile on his wife's face. Funeral arrangements for Justice are pending. Earlier this month, two other Iowa National Guard "Red Bull" soldiers were killed and others wounded in separate combat incidents, and in different Afghan provinces. Bloggers and pundits are buzzing following investigative reports alleging that many events described in Greg Mortenson's best-selling "Three Cups of Tea" books never happened, and that the Central Asia Institute (C.A.I. ), a related a non-profit organization, has failed to build, maintain, or staff many of the schools it promised to build in Afghanistan and Pakistan. One of the CAI best-known fund-raising efforts is "Pennies for Peace," which encourages school-age children to collect and donate spare change toward building schools overseas. Mortenson was the subject of a CBS "60 Minutes" report on Sun., April 17. Jon Krakauer, best-selling author of such books as "Into Thin Air" and "Where Men Win Glory," subsequently released a 77-page featurette titled "Three Cups of Deceit." The product is available electronically as a free download here. Mortenson, a perennial Nobel Peace Prize nominee, did not participate in the "60 Minutes" report, although he has responded through Outside magazine and the hometown newspaper in Bozeman, Mont. For years, the book "Three Cups of Tea" and its related products have served as a much-cited supporting narrative for U.S. Army counterinsurgency doctrine (often abbreviated and pronounced "COIN" in military circles). The phrase, which alludes to the gradual relationship-building that takes place during social interactions, is commonly used by U.S. soldiers when talking of meetings with Afghan governmental, tribal, police and military personnel. "Gotta go drink our three cups of tea" is to the Afghan generation what "winning hearts and minds" was to Vietnam's. His impulse was straight out of Mortenson’s Three Cups of Tea, an account of cross-cultural understanding in Central Asia that’s become faddish in counterinsurgency circles. The core lesson: treat the Afghans with respect; address their concerns; and they’ll scratch your back, too. If you don’t, don’t be surprised when you don’t get their cooperation against the Taliban. After I accompanied the sunny Balan on his tech support mission, he asked if I’d read Mortenson’s book. When I told him I hadn’t, he fetched his dog-eared copy from his trailer and gave it to me to keep. Regardless of how the accusations and potential lawsuits sort out, the latest chapter in Mortenson's life story casts unwelcome doubt on counterinsurgency doctrine and methods, and, more generally, philanthropic efforts in a tight economy. Ackerman writes: "[S]hould [the allegations against Mortenson] discredit the message that the military’s embraced? '60 Minutes‘ main allegations don’t suggest as much. They’re about Mortenson’s integrity, not his thesis." In the Red Bull Rising blog alone, "Three Cups of Tea" has been reviewed and discussed numerous times (see here and here for examples). Many of Mortenson's lessons are still valid, regardless any failings and frailties on his part. Other lessons can be derived from Mortenson's fall from popular grace. For example, Gen. David Petraeus distilled these three core lessons from Mortenson's "Three Cups of Tea." 1. "We need to listen more." 2. "We need to have respect." 3. "We have to build relationships." That's all good advice for do-gooders of all types, in uniform, in media, and in the non-profit sector! 4. "Counterinsurgency is a long-term commitment." 5. "Beware the laptop Army." You can't instill change by managing spreadsheets in the Tactical Operations Center ("TOC"). 6. "Half of diplomacy is just showing up." You're halfway there if you meet with people, look them in the eyes, and talk to them. 7. "You cannot plug in democracy. You have to build democracy." Whether you live in Washington or Waziristan, you can't be part of the change unless you're engaged on the ground. 8. "Trust, but verify. Only then, should you donate." A Minnesota teacher is using Mortenson's difficulties as a teachable moment in her classroom. Her students had raised $862.02 to help build a school in Pakistan. Next time, she hopes they'll be more successful, in part by investigating their giving options more diligently. Look for ratings, audits, and certifications, before you sign a check--or send in your hard-won pennies. 9. "People of all types must be held accountable." Investigative journalism is about keeping people accountable, whether in government, business, the military, or non-profit. It's not mean-spirited to hold people accountable, but it is mean-spirited to take pleasure in other people's difficulties. It's notable that so many commenters have rushed to judge Mortenson, citing Krakauer's just-the-facts gumshoe reporting, when many of those same commenters have delighted in the supposed rehabilitation of U.S. commander in Afghanistan Gen. Stanley McChrystal, a central character in the alleged high-level cover-up and mis-appropriation of U.S. soldier Pat Tillman's 2004 death by friendly-fire. Krakauer wrote a whole book on Tillman and his death. In other words: If Krakauer is right about Mortenson, isn't he also right about McChrystal? A permanent "Help Our Soldiers" web page has newly been posted on the Red Bull Rising blog. (Click here for link). During its deployment to Afghanistan, the 2nd Brigade Combat Team (B.C.T. ), 34th Infantry "Red Bull" Division has experienced two combat deaths, and eight combat injuries reported by the media. Cpl. Adam Eilers, 21, of Garber, was one of three soldiers wounded in Afghanistan's Laghman Province during a Feb. 21 Improvised Explosive Device (I.E.D.) attack. Eliers is a member of Alpha Company, 1st Battalion, 133rd Infantry Battalion. As of Feb. 23, Eilers was reported to be located at Walter Reed Army Medical Center, Washington, D.C. In subsequent news reports, family members indicated injuries to Eilers' brain, liver, spleen, and stomach. A fundraiser event on behalf of the Eilers family is scheduled for 4 to 8 p.m., Sat., April 23, at the Lakeside Ballroom, 1202 N 4th St, Guttenberg, Iowa. The event includes a free-will donation pork-sandwich dinner, raffle, and auction. The auction will begin at 6 p.m. A dance will follow at 9 p.m., cover charge $5. For more information, click here for the April 23 event's Facebook listing. There have certainly been more than eight combat injuries on the deployment. As of April 14, for example, Iowa National Guard officials noted that a total of 12 Iowa "Red Bull" soldiers had been medically evacuated from Afghanistan. Further, this number does not reflect any evacuations having taken place within the 1st Squadron, 134th Cavalry Regiment (1-134th Cav. ), a Nebraska Army National Guard unit taking part in the 2-34th BCT deployment. To the general public, updates on injured soldiers can seem arbitrary and sporadic. Initial reports can take hours or days to process and validate. Then, there are privacy concerns. According to Iowa and Nebraska National Guard spokepeople, medical statuses of injured soldiers are not officially releasable unless soldiers have authorized disclosure of private medical information. Also, healing and recovery can take weeks, months, and even years. There's a difference between the public's want to know and an individual's need to heal. Each soldier and family must focus on their own priorities, and on their own timelines. Send event notices and news items, updates and corrections regarding the "Help Our Soldiers" page to: sherpa [AT] redbullrising.com. Spc. Donald L. Nichols, 21, of Shell Rock, Iowa, was killed by an Improvised Explosive Device (I.E.D.) during a routine mounted patrol in Afghanistan's Mehtar Lam District, Laghman Province. The incident occurred approximately 11 a.m. local time, Wed., April 13. The other occupant of the four-wheeled armored vehicle at the time, Spc. Timothy R. Gourd, 24, of Prescott, was injured in the attack. Two other passengers had previously dismounted and were outside the vehicle when the blast occurred. Iowa National Guard officials made the public announcement at a 7 p.m., Thurs., April 14, press conference at Camp Dodge, Johnston. Both soldiers are members of Headquarters and Headquarters Company (H.H.C. ), 1st Battalion, 133rd Infantry Regiment, headquartered in Waterloo. Nichols' is the second death of a soldier assigned to the 2nd Brigade Combat Team (B.C.T. ), 34th Infantry "Red Bull" Division since the 2,800-member unit arrived in Afghanistan last November. The first was Sgt. 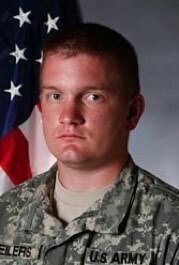 Brent M. Maher, 31, of Honey Creek, Iowa, who was deployed 1st Battalion, 168th Infantry Regiment (1-168th Inf.). Maher was also killed earlier this week by an IED attack, but in Paktiya Province. The Mine-Resistant Ambush-Protected All-Terrain Vehicle (M-ATV, pronounced "M.A.T.V.") involved in Wednesday's incident is one of the newest and most-advanced types of wheeled armored vehicles in the U.S. Army inventory. During the press conference, guard officials said the initial information they received did not indicate that there was a gunner in the vehicle at the time of the attack, and did not indicate there was any type of attack other than the explosive device. Nichols was an Infantry soldier, and a member of the 1-133rd Infantry's scout platoon--a smaller group of soldiers within the battalion, who are specially trained in "sneak and peak" reconnaissance missions. 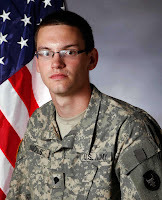 Cadet Andrew Brown of Atlantic, Iowa, was an enlisted scout team leader who served with Nichols before the deployment. "[The scouts were] usually your soldiers who were in better physical shape," he said at the Thursday night press conference. "The 'best of the best,' so to speak." Brown recalled Nichols as a quick-to-laugh, eager-to-learn soldier. "He always had his notebook out," Brown said. Egged on by Nichols, some of the scouts would routinely conduct all-night poker sessions during drill weekends. In a written statement made through the Iowa National Guard, the Nichols family said, in part: "We are deeply saddened by our loss, but extremely proud of the honorable way he served America as a leader in the U.S. Army. We will remember him, his sense of humor, his 'snarky' attitude, and his love for his family, friends and his country, with great pride." According to a report earlier in the day by the Des Moines (Iowa) Register, flags at Waverly-Shellrock High School flew at half-staff in honor of Nichols, who was a 2009 graduate of the school. Nichols is surved by his mother and father, Robert and Becky Pook of Waterloo; his father and mother, Jeff and Jeanie Nichols of Shell Rock; his fianceé, Chelsey Bliss of Waverly; and brothers Joe, an Army Reservist currently stationed in Afghanistan but not on the Red Bull deployment, and Nick of Waterloo. During the press conference, guard spokesman Hapgood complimented Red Bull soldiers' training and professionalism, and urged they remain vigilant until their return to Iowa later this summer. 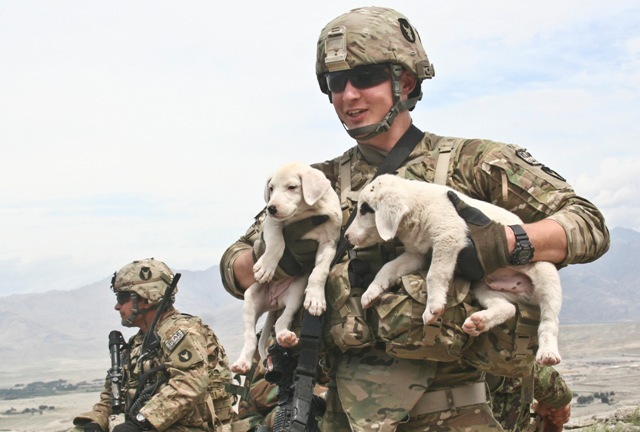 "Certainly, when you have 2,800 soldiers in Afghanistan harm's way, every day, we count our blessings that they've had not only a very successful mission, but a very safe mission," said Hapgood. "Up until now, we've only evacuated 12 soldiers with injuries, prior to this week. I think that's very much indicative of the training these soldiers have received, and their expertise at what they do." "Suffice it to say, it's an extremely dangerous place," he told reporters. "One thing that we stress with our soldiers during a deployment is that, regardless of how much time you have left, you can never get complacent. This [IED attack] certainly crystalizes that. You have to constantly maintain awareness of your surroundings, and use every tool at your disposal. Every day over there is dangerous." Spc. Brent M. Maher, 31, of Honey Creek, Iowa, was killed while on a routine mounted combat patrol in Eastern Afghanistan's Paktiya Province Mon., April 11. His death was announced by Iowa National Guard officials at a 9 p.m. Tuesday press conference at Camp Dodge, Johnston. The 32,000-pound "Cougar" mine-resistant vehicle was reportedly rolled over by what Iowa guard spokesman Col. Gregory Hapgood described as a "sizeable" Improvised Explosive Device (I.E.D.). Maher had been seated in the gunner's position--most likely manning a machine gun in a small, lightly armored cupola located atop the vehicle--when the bomb detonated under the vehicle. The task of gunner is commonly regarded as one of the more dangerous positions on a mounted patrol. "It takes an amazing amount of personal courage to be willing to get up there and do that gunner job everyday," said Hapgood. "You look at Spc. Maher--just a remarkable young man, well-trained, loved what he did, loved his country, and loved his family. Despite the risks, he was willing to do that, every day." Sgt. 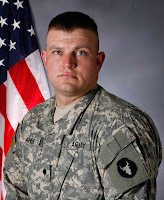 1st Class Nicholas Jedlicka, 31, of Council Bluffs. Spc. 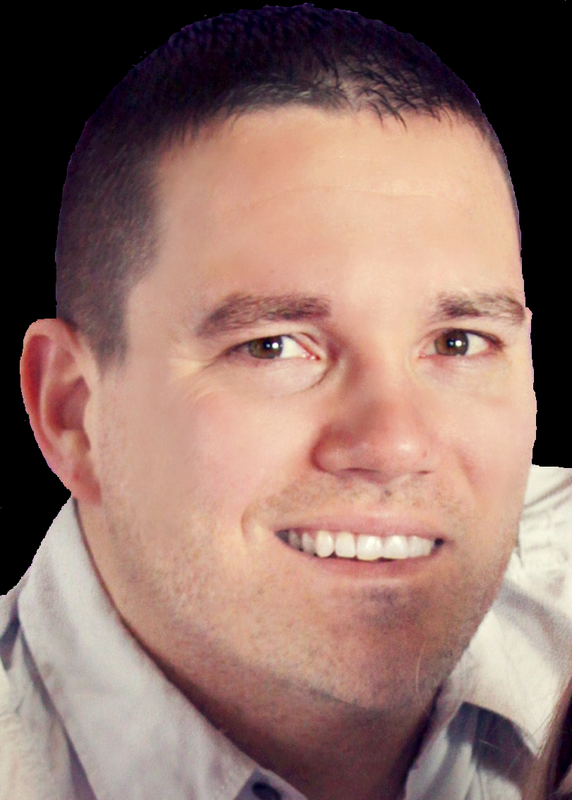 Justin Christiansen, 24, of Nebraska City, Neb. Spc. Dustin Morrison, 20, of New Market, Iowa. Medical statuses of the wounded soldiers were not available at the conference. All four soldiers were assigned to the Iowa Army National Guard's Bravo Company, 1st Battalion, 168 Infantry Regiment (1-168th Inf.). The company is headquartered in Shenandoah. Maher's former squad leader, Staff. Sgt. Anthony Karr, described Maher as a shirt-off-his-back, go-to soldier. "I would always go to him, because he would get the job done," Karr said at the press conference. Before joining the Iowa Army National Guard as an infantry soldier, Maher had previously served in the U.S. Navy for a total military career of 11 years. During Maher's mid-tour leave from Afghanistan, Karr said, Maher had voluntarily traveled to the Shenandoah armory to take a physical fitness test, working toward a promotion. Maher will be posthumously promoted to the rank of sergeant, Iowa guard officials said. Maher is the 20th combat death of an Iowa National Guard member since 2003. We are proud of Brent's accomplishments and those of his fellow Iowa National Guard soldiers and all of the military serving our country. We are forever grateful to the United States military for providing Brent with the opportunities he has experienced for the past 11 years. Brent was making a difference in the lives of the Afghan people, and was proud of it. As shocked as we are by his death, we are deeply appreciative of the outpouring of support shown by his fellow soldiers, his family, his friends, and the community during this difficult time. Hapgood also expressed empathy for Maher's fellow soldiers. "Losing one soldier is one too many," he said. "It's difficult to lose a buddy and then go back to work the next day." The 1-168th Inf. is part of the Iowa National Guard's 2nd Brigade Combat Team (B.C.T. ), 34th Infantry "Red Bull" Division (2-34th BCT) deployment to Afghanistan. The 600-soldier battalion arrived in Paktiya Province in November 2010, and currently operates under "Task Force Duke," which is organized around the active-duty Army's 3rd BCT, 1st Infantry Division (3-1st BCT). Operating as "Task Force Lethal," the 1-168th Inf. mission is to assist the Government of the Islamic Republic of Afghanistan and its national security forces to improve conditions toward security, governance, and development in the province. A portion of Paktiya borders the country of Pakistan, and the area is not contiguous with other provinces for which the 2-34th BCT's "Task Force Red Bulls" is responsible. Minnesota Army National Guard soldier John Kriesel deployed to Iraq in 2006 as part of the 1st Brigade Combat Team (B.C.T. ), 34th Infantry "Red Bull" Division (1-34th BCT). In December of that year, an Improvised Explosive Device (I.E.D) large enough to take out a Bradley armored personnel carrier instead detonated under Kriesel's decidedly less-hardy Humvee. He lost both legs, and two buddies. This is more than a war story, or a medical memoir. This is a story of a family. Written mostly in first-person (when Kriesel is unconscious, friends and family pick up the story), the book start by covering the usual bases expected of a coming-of-enlistment-age memoir: How I joined the Army; how I deployed for the first time (as a "peacekeeper" to a riotous Kosovo, along with the Iowa Army National Guard's 1st Squadron, 113th Cavalry Regiment); and how I was almost done with Army until I decided to deploy again. Midway through the book, when the bomb goes off under his truck, Kriesel reports that the sound of the blast isn't all that loud. Or maybe it's so loud it's quiet. Like the "ringing in your ears a couple of hours after leaving a super-loud concert." As a writer, Kosmo successfully achieves a balance between providing just enough military-and-medical detail and serving the greater story. In an epilogue, he shares an anecdote of when he workshopped the first few chapters of the book with a group of Twin Cities writers. Today in Minnesota, both Kriesels stand together and on firmer ground. The former citizen-soldier is now a marketing and advertising contractor for the Minnesota National Guard, a motivational speaker, and a state legislator. 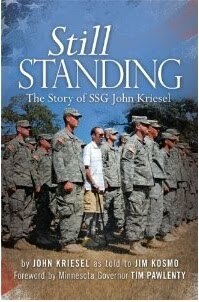 "If I can't fight," Kriesel says, "I can still serve." 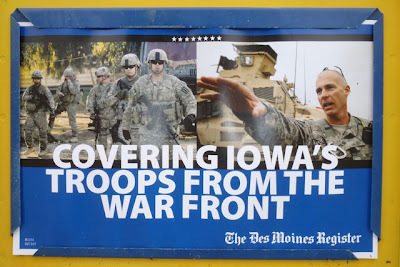 "I read the news today, oh boy ..."
Yesterday, the Des Moines Register posted an early report that two Iowa National Guard soldiers had been injured in an Improvised Explosive Device (I.E.D.) attack in Afghanistan--Laghman Province, most likely, given that they're from the 1st Battalion, 133rd Infantry Regment (1-133rd Inf.) --and had been evacuated to Germany. The count of 2nd Brigade Combat Team (B.C.T. ), 34th Infantry "Red Bull" Division soldiers (2-34th BCT) seriously injured on its current deployment now totals six. A few hours later, the Omaha World-Herald posted a gritty and grippy article about soldiers from 1st Squadron, 113th Cavalry Regiment, engaged in a Parwan Province firefight. "Woke up. Fell out of bed. Dragged a comb across my head." Archer is home from Afghanistan for a few days. We met up at a local pie-shop yesterday, and didn't talk about too much that was too important. That morning, I'd seen The Postman's wife post on Facebook a glimpse of her camouflaged husband, snapped as he crossed the threshold between Jetway and Delta Airlines. Two weeks ago, we met at Bennigan's. Now, he's back to Bagram. The Great Freedom Bird is, without doubt, a fickle and migratory animal. It only rests in one place for a fortnight. Meanwhile, there's the rushing sound of a threatened U.S. federal government shutdown. Soldiers may not got paid on time. Families at home are worried about paying the rent, and off-duty soldiers downrange have little to do but take it out on the Internet. If you think all the flinging of political venom and excrement isn't playing well back home in Panora, think how it's playing downrange in Parwan. There are approximately 3,000 soldiers on the 2-34th BCT deployment. Each day brings a soldier another story. Some of those stories are heart-pounding, some are chest-thumping. Some are filled with confusion, hurt, or injury. Some are contemplative and thought-provoking. The passage of each is worthy of note. The current Afghan deployment of 2nd Brigade Combat Team (B.C.T. ), 34th Infantry "Red Bull" Division (2-34th BCT) is showcased in the March-April 2011 issue of GX: The Guard Experience Magazine. 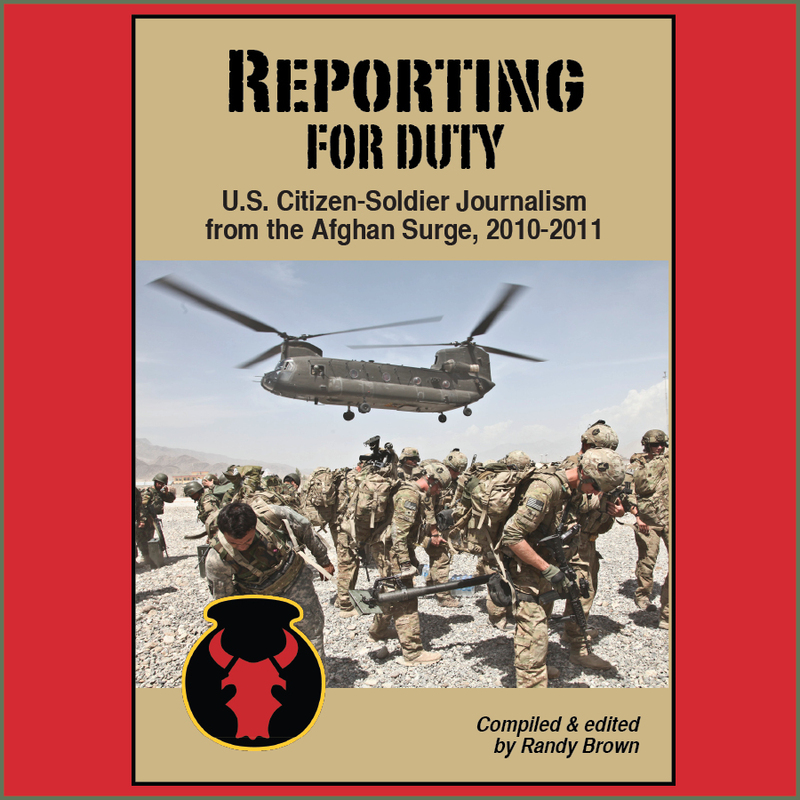 The glossy, 250,000-circulation nationwide publication "connects guard soldiers and their families with news, information, and lifestyle pieces," and is produced by IOStudio, Nashville. My father was in the marines, and that gave me access to the local American Legion and VFW as a small boy. I can remember those World War II Vets wearing “Red Bulls” on their shoulders. I looked at them with awe and honor. Most of them—-you didn’t even know they were in the military until it was Veterans Day or Memorial Day, when they put on their uniform for the local parade. I was there with the 1st of the 34th in Iraq when the Sunni uprising occurred in 2006. I remember sitting in a dining facility in a place called Hit, Iraq, as CNN reported that Al Anbar was lost. I was sitting in Al Anbar and remember thinking, "you know what—this isn’t lost. This is hard work, but we can still be successful.” I feel honored that I had a front-row seat and watched that transition take place in Iraq in 2006. I believe I’m in the same place in history right here in Afghanistan today, because we are in a historical moment. I’m awfully proud today to be part of this. The soldiers that work for me here make me pretty proud every day. And I know history is in the making here with what we are doing. In the the same issue of GX Magazine, the story of World War II Medal of Honor recipient Staff Sgt. George J. 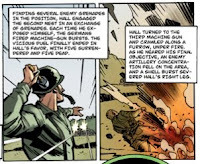 Hall is presented as a one-page comic (page 106; spread 55). 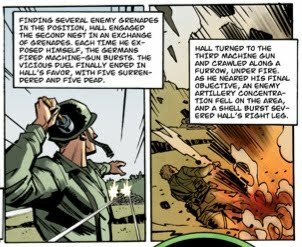 Hall, a Red Bull soldier of Bravo Company, 135th Infantry Regiment, single-handedly assaulted three enemy machine-gun nests in actions at Anzio, Italy, 1944. It was, by some reports, a dark and stormy night in Afghanistan. "Fierce lightning shattered the night sky as a U.S. Army CH-47 Chinook helicopter’s 350-pound blades sliced through the air producing a continuous rain of thunder over the otherwise quiet Galuch Valley," wrote U.S. Army Sgt. Amanda Jo Brown, a public affairs soldier with the 10th Combat Aviation Brigade, 101st Airborne Division. According to reports subsequently published by military and civilian news outlets, the Iowa National Guard's 2nd Brigade Combat Team (B.C.T. ), 34th Infantry "Red Bull" Division (2-34th BCT) participated in the largest helicopter-borne assault yet conducted in Eastern Afghanistan during the active-duty 101st Airborne Division's current Afghan rotation. During "Operation Bull Whip," approximately 2,200 Afghan and coalition troops moved into the Galuch Valley, Laghman Province. Starting March 25, the Red Bull soldiers were to search out enemy personnel and equipment, so that Afghan government officials could assemble local leaders at a community meeting called a "shura," and subsequently establish a district-level presence. Most of the 2-34th BCT is currently organized as "Task Force Red Bulls," headquartered at Bagram Airfield ("BAF"). News reports on the operation specifically mentioned involvement of Iowa units such as the 1st Battalion, 133rd Infantry Regiment (1-133rd Inf. ); 1st Squadron, 113th Cavalry Regiment (1-113th Cav. ); and 334th Brigade Support Battalion (B.S.B.). Laghman Province has been an area of responsibility of the 1-133rd Inf. since last November. The raid marked the third time in a little more than a year that U.S. or Afghan troops tried to dislodge insurgents from the area. The Taliban killed several U.S. and Afghan government soldiers during the two previous raids. The French Army, which participated in this week’s operation, also has lost soldiers in the area. This time, the allies flooded the valleys with troops, and most of the Taliban apparently fled. The operation was planned in secret, but insurgents probably figured something was coming after provincial leaders announced several weeks ago that they intended to set up a district government center in the area. Then, shortly before the troops hit the ground last weekend, the Americans dropped leaflets warning that a raid was imminent. 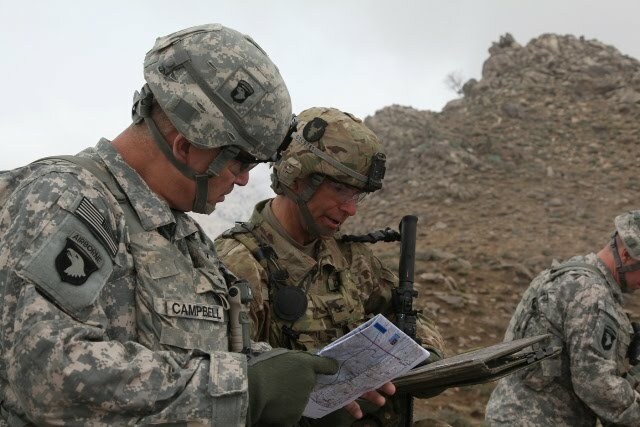 I joined Task Force Red Bulls' Commander, Col. Ben Corell at his Tactical Command Post on the side of a mountain during their Operation Bull Whip. With the Afghan National Security Forces, TF Red Bulls conducted this operation to defeat insurgents in the western part of the Laghman Province in order to allow [Government of the Islamic Republic of Afghanistan] to establish governance in the area. While there, TF Red Bulls uncovered several caches and conducted a peace shura with the locals and the governor of Laghman, Governor Azizi. The peace shura was successful, and the local and provincial government established a [Government of the Islamic Republic of Afghanistan] presence in the area for the first time. For photos of Campbell's visit to the Task Force Red Bulls command post, click here. For more on the aviation training and support leading up to Operation Bull Whip, click here. For video of sling-load operations conducted by Alpha Company, 334th BSB, Task Force Red Bulls during Operation Bull Whip, click here. For photos of Red Bull and Afghan soldiers participating in Operation Bull Whip, click here. UPDATE (April 7): For more photos and a news article wrapping-up Operation Bull Whip, click here. Red Bull soldiers from the Iowa and Nebraska Army National Guards continue to make news in Afghanistan this spring, thanks in part to efforts such as those by Des Moines (Iowa) Register, the Omaha World-Herald, the KCRG-TV9/Cedar Rapids (Iowa) Gazette, and others. Here's a quick Public Service Announcement on behalf of the embattled Fourth Estate: Buy their newspapers. Send editors and producers thank-you letters. You can even "like" them on Facebook. Let them all know you're reading and watching, and that you appreciate and support their coverage. Freedom isn't free, and neither is journalism. The "largest air-assault operation in the history of the Iowa Army National Guard," begun Mar. 25 in Laghman Province. In more-upbeat news, the continued rotation of soldiers home on 15 days of mid-tour military leave. Homecoming stories are typically warm and emotional, and this recent KCRG-TV9/Cedar Rapids Gazette story certainly is no different, save for one little detail: It may just be the best such story ever.